This is a very unusual type of post for me as I’m normally the math/science person, not the artistic one. 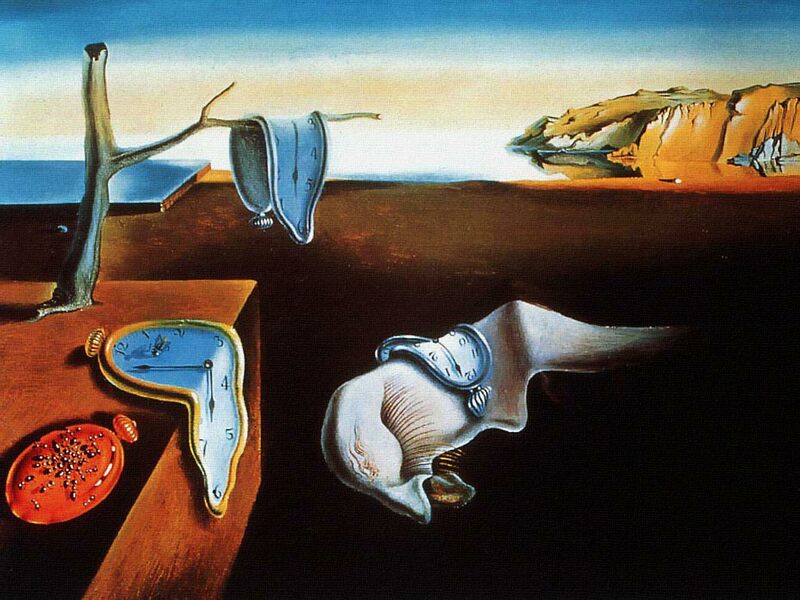 But without further ado, here is Dalí’s famous time painting. What is so special about this work? My opinion: This painting epitomizes the human struggle with time. Not necessarily against time—rather, of time. Dalí realized that we had lived too long in a world in which time was an absolute definer, a Newtonian clockwork that controlled us with two rigid, always-moving hands. In this painting, time, represented by the deformed clocks, is no longer a straight issue: it bends, curves, and is hung in meaningless places. There is a contrast between things of human design, i.e. the clocks and rectangular objects on the left, and things of natural design, i.e. the tree stump, the mountains, the sky. The objects of the first group are futile in the picture; the objects in the latter group are hopeful (for a lack of a better word, which I cannot think of). Also interesting is why the title is “The Persistence of Memory” when it seems to deal with time. The obvious explanation is of course that memory becomes confused, uncertain, nonsensical over time. But moreover, I see the painting as a play on time itself, the philosophical entity behind time, rather than its outer appearance. Thus, the content and form of the painting work together and build on each other, much like the electric and magnetic fields in an electromagnetic wave. Okay, bad analogy for liberal arts majors, but physicists, you should understand.